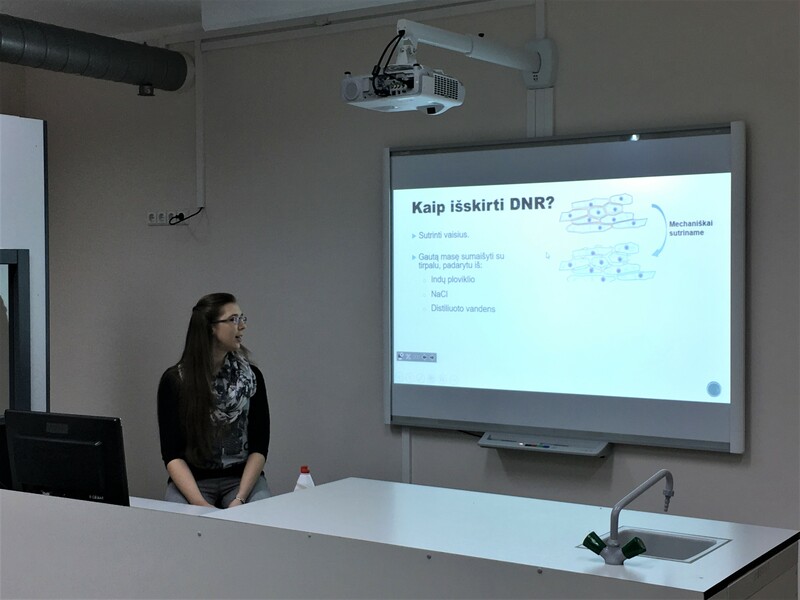 With the intention to involve children in biosciences, our team played a part in the establishment of an educational project the "UNO Academy" aiming to raise the young-generation's interest in science. 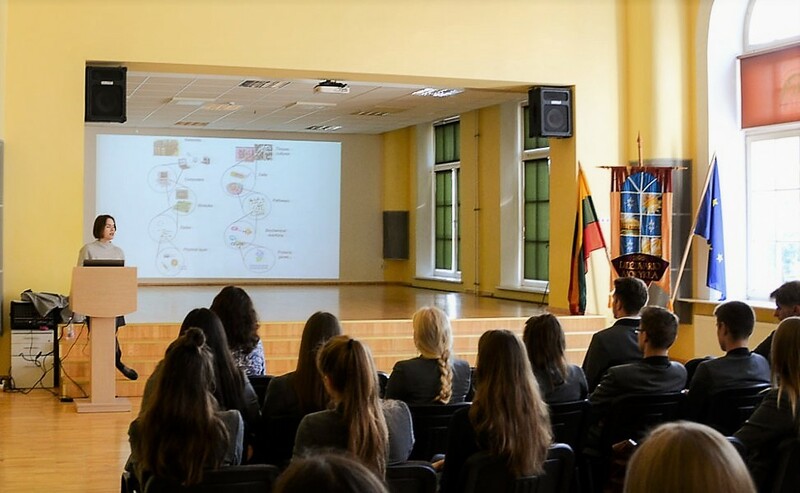 We held lessons in more than 10 schools with an aim to spread the message about synthetic biology and iGEM all around Lithuania. Over 450 students attended our interactive presentations, where they could learn about the basic concepts of synbio, the competition and the future of science itself. Several major events for scholars to gain in-depth knowledge about various scientific fields take place annually in Lithuania. 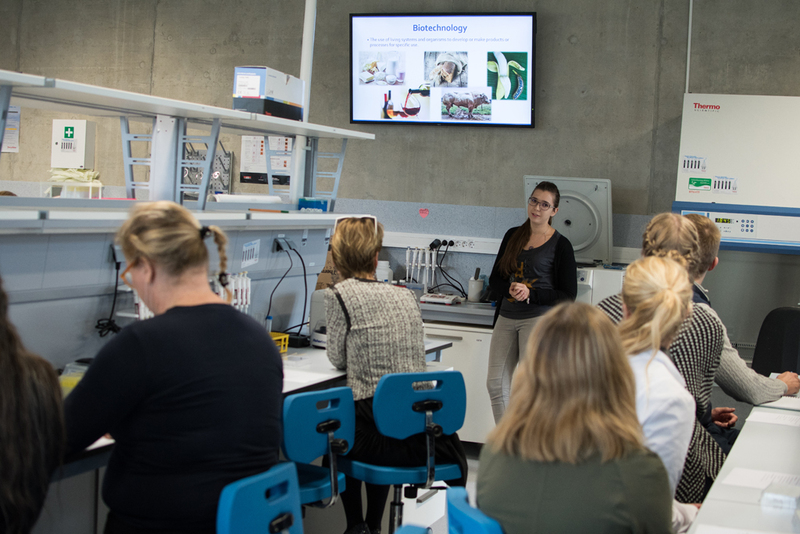 We held extensive lectures on the principles of synbio, discussions about bioethics and biosafety, as well as organised various workshops. We welcomed two highly motivated highschool students into our team to observe, learn and contribute to the iGEM project. In order to reach a bigger part of the general public and involve as much people as possible in the science communication activities, we organized interactive discussions on topics from cellular ageing to XenoDNA. 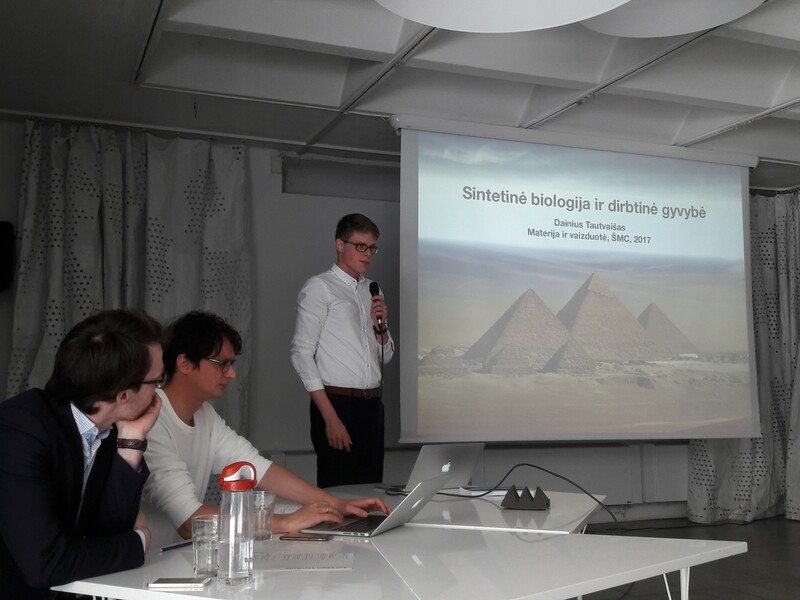 We organised a workshop on enzyme production in biotechnology during the international DIYBio Network meeting in Vilnius. We showed how enzymes are detected in nature, transformed into bacteria and purified for best applications. 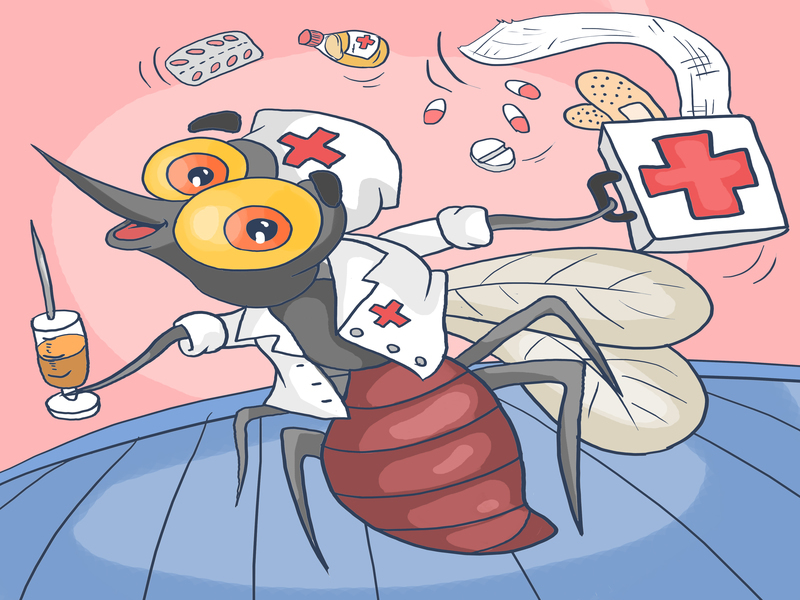 One of our outreach goals was to connect with the non-scientific community and acquaint them with synthetic biology, therefore our team took part in various international conferences and major events that attracted over 5,000 people. We arranged the initial meeting with the UNO Parks and later were invited to contribute to the creation of the "UNO Academy" - an interactive educational program for children aged 7 to 12 years. The program aimed to encourage toddlers to explore science through fun and interactive learning modules. "UNO Academy" included the STEAM fields - Science, Technology, Engineering, Arts, and Mathematics. Its goal was to teach students to think critically and have not only an engineering but also imaginative and creative approach towards real-world problems while building on their current mathematics and science base. We believe that synthetic biology requires boundless imagination. As it becomes limited with age and received knowledge, it is crucial to introduce the possibilities of synthetic biology to youngest-children-possible. Teaching how synbio allows the modifying of living organisms and creating new forms of life might result in their childish ideas becoming the most mind-blowing synbio discoveries in the future. The Science part of the "UNO Academy" was introduced as an exhibition of arthropods. Having the main idea - to adopt nature to serve for human needs - of synthetic biology in mind, we created an exhibition of paintings of arthropods, that were depicted performing unusual, yet profitable functions. Children were invited to explore the unity and diversity of the arthropods as well as colour the paintings and draw their own creatures. The exhibition of paintings and other engaging activities gave the opportunity to teach young children about synthetic biology without stressing the complexity, however emphasizing its possibilities. 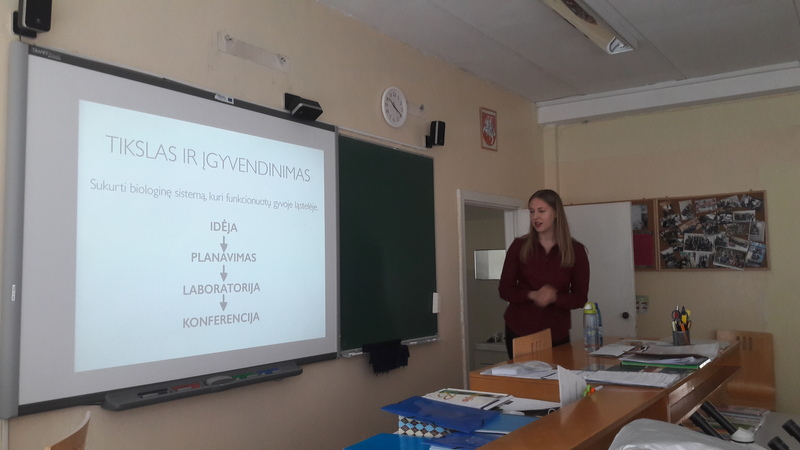 We held lessons at more than 10 schools with an aim to spread the message about synthetic biology and iGEM all around Lithuania. Over 450 students attended our interactive presentations, where they could learn about the basic concepts of synbio, the competition and the future of science itself. Former Vilnius-Lithuania teams had discovered that school children are often poorly informed and have a negative attitude towards science, so this year we realised the necessity not only to continue visiting Lithuanian schools, but also do it in a modern and engaging fashion. It is crucial to continuously excite students about life sciences and what possibilities they hold for them and the whole mankind in the future. During the numerous lessons that the team members held, our main aim was to provide the students with basic knowledge about synthetic biology, genetic engineering and spark an interest in science. Thus, presentations about the principles, current applications and perspectives of these fields were given. In order to paint the whole picture, we made sure to inform the scholars about the possible risks, ethical issues and other difficulties that scientists face. The team members discussed with the children common fears related to GMOs and other concerns that the children had about genetic modification. Moreover, as students were very eager to learn more about this year's idea, team members introduced them with the basic concepts of SynORI. After the lessons the students approached us with various questions in groups or individually. This clearly demonstrated that we successfully managed to excite them with the rapidly developing field of synthetic biology and encouraged to take part in science more actively, possibly, even joining iGEM in the future. Several major events for scholars to gain in-depth knowledge about various scientific fields take place annually in Lithuania. This year our team hosted national biotech sessions. 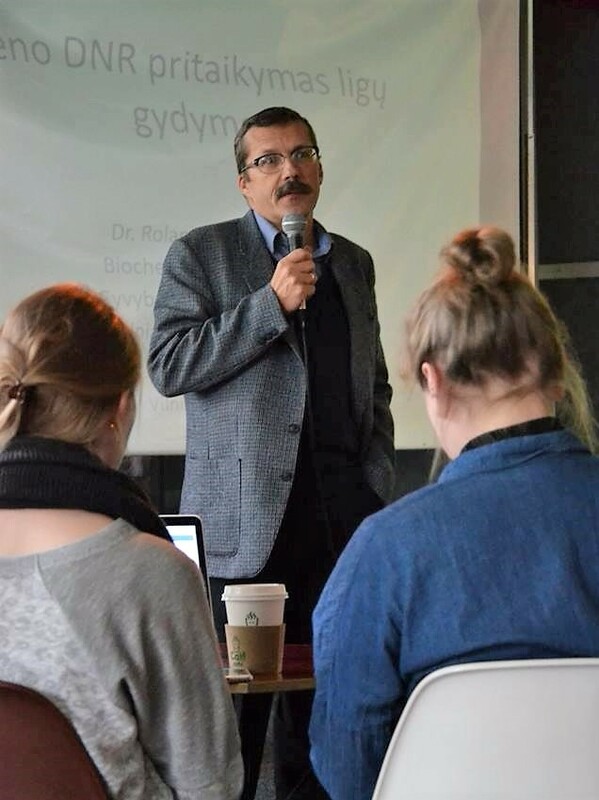 Extensive lectures on the principles of synbio, as well as discussions about bioethics and biosafety were held. 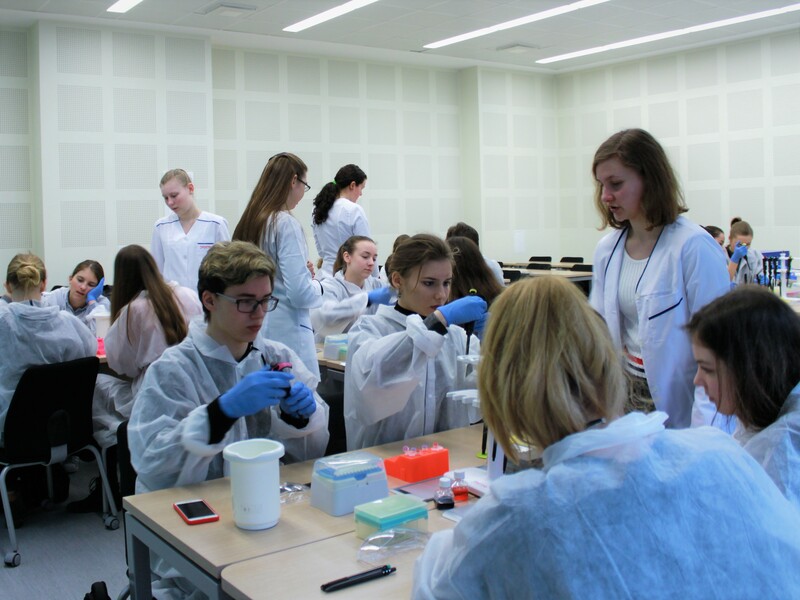 During the workshops students extracted DNA from fruit, learned pipetting and even used CRISPR-Cas9 system. "Student For One Day" and "Students for scholars, scholars for students"
"Student For One Day" and "Students for scholars, scholars for students" are annual events, that invite high school students to experience advanced learning by attending various lectures and workshops at the Vilnius University. During these events our team members organised workshops, where school students were introduced to the structure of DNA, gene technology and synthetic biology. Not only did we provide the scholars with deeper perception of DNA, but they were also able to extract and precipitate it. Participants demonstrated great interest in life sciences and the creation of new organisms with desired features. Being responsible scientists and participants of the iGEM competition, we brought this discussion further by acquainting the school children with bioethical issues and addressing possible outcomes and the impact of GMOs on the environment. This was a part of our face-to-face interactions with highly motivated students, and we received valuable insights which helped us to improve our future educational activities. NSA is a unique institution of supplementary education intended for gifted children. The Academy aims to strengthen intellectual potential of Lithuania by organising various sessions with the best lecturers and professionals from Lithuania and other countries. Our team members took part, among other inspirational professors and scientists, in the Biochemistry section of the 10-day Summer Boot Camp of NSA, where they held lectures and a workshop. The scholars expanded their knowledge on genetic engineering and were introduced to the concepts of synbio, including applications, such as biosensors. Realising the substantial scope of CRISPR-Cas9, we introduced the school children to its principles and recent discoveries. Scholars even had the chance to conduct an experiment using CRISPR-Cas9 themselves. As all of the lectures were directly related to genetic modification and engineering of new generation creatures, the pupils were engaged in a discussion about biosafety and bioethics. Asked to imagine possible prospective scenarios of reckless science, they were encouraged to carry out responsible research in the future. This was the most demanding and extensive, yet the most engaging course that our team held for the school children. NSA allowed us not only to truly educate the scholars, but also to spark major interest in life sciences and raise awareness on biosafety and biosecurity as well. Several school students reached out to us feeling eager to join our team and experience the scientific work firsthand. We were delighted by their enthusiasm and happily welcomed them into our team. "My name is Agne Cepaite and I am a 10th grade student. I was given an opportunity to engage with the Vilnius-Lithuania iGEM 2017 team's work, to observe, help out and, most importantly, learn. This has been an incredible experience, I had a chance to work in a laboratory and help with the InterLab project, as well as engage in activities of Human Practices. I enjoyed both, however I am very interested in the subject of biological sciences, therefore the laboratory work was probably the most mesmerizing, since I have never worked in a lab before. It was definitely challenging, since my knowledge did not extend as far as I wanted, however with a very accepting and teaching team, I have learned many new things about molecular and synthetic biology." 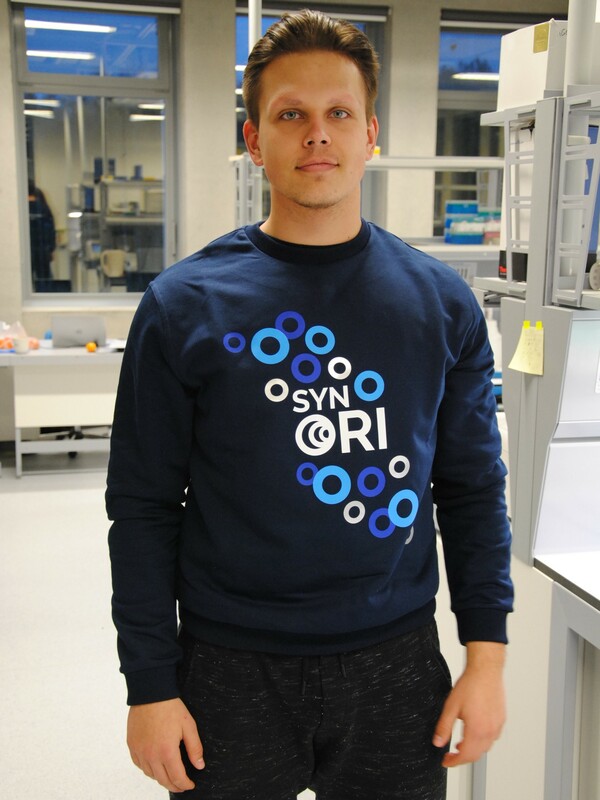 "The opportunity of being a trainee at Vilnius-Lithuania iGEM team of 2017 opened my eyes to the world of Synthetic Biology. It was a truly outstanding experience mainly due to the vast knowledge and extreme proficiency in their study fields from the whole iGEM team, which I was able to observe and learn from. During discussions about the lab and the fundamentals of the idea I was astonished nearly 100% of the time because of the intense flow of new concepts and ideas. Furthermore, aiding the team in other fields such as HP was very new to me, I was never part of such a big group project and was certainly never appointed to help design scientific activities and even take part in sharing the responsibility of the project. I now see the iGEM competition as something great not just because it helps to form and characterize synthetic biology, but of what it helps others to achieve through hard work, determination and, most importantly, teamwork. 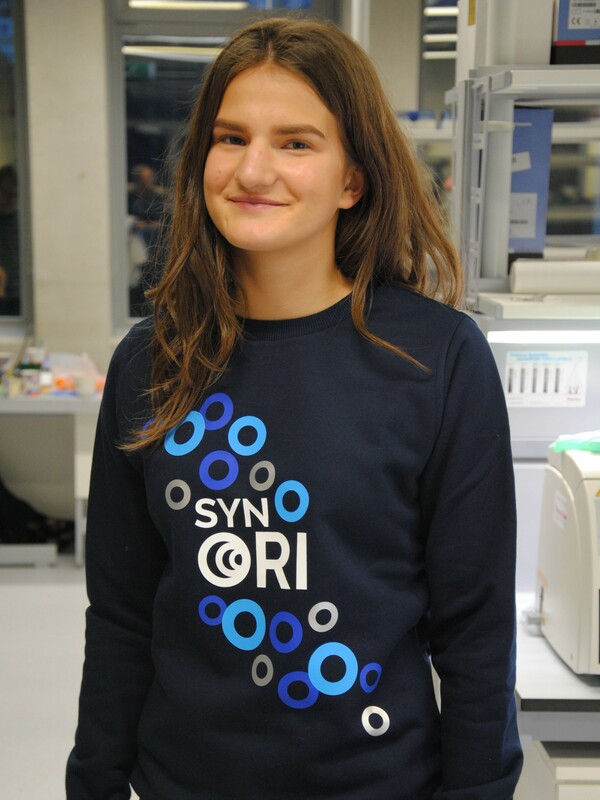 I aspire to become competent enough in my field over the course of couple of years and then attempt to give another shot at the iGEM competition, but this time as a proper team member to experience everything first hand." 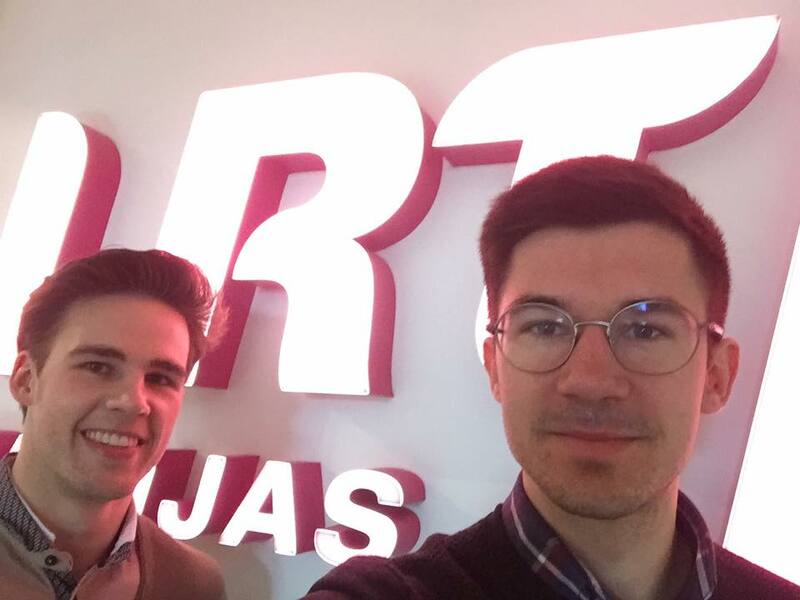 Our team was invited to collaborate with the Baltic Institute of Advanced Technology in order to bring the SPARKS Project to Lithuania. This initiative aims to involve the citizens in rapidly developing fields of science, as well as promote and communicate the importance of Responsible Research and Innovation. 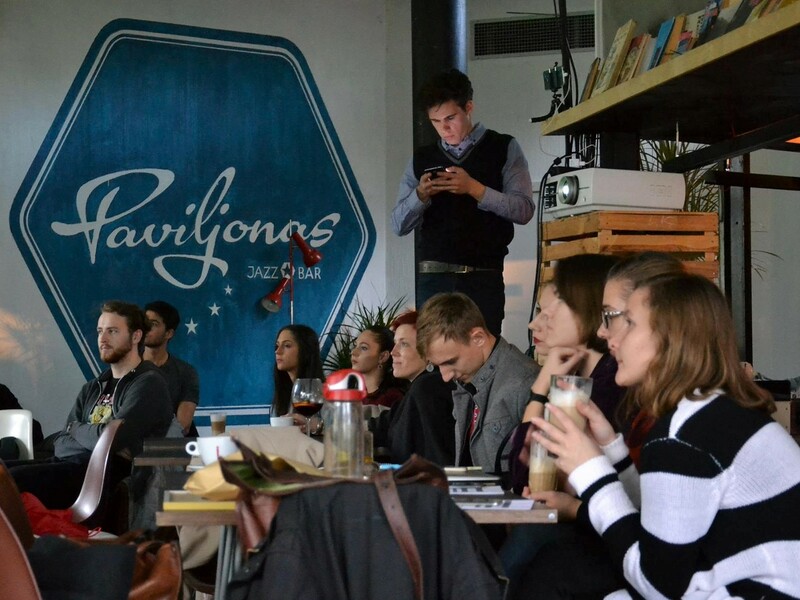 At our first Science Espresso, "The Control of Cellular Ageing Mechanisms: an Everlasting Youth", we addressed the issues of cellular ageing with Mantas Matjusaitis from CellAge - a disruptive synthetic biology start-up aiming to increase human health and lifespan. An introduction on what is ageing and what kind of cellular mechanisms control it was made. Attendees discussed various issues, such as ethical aspects of living forever. The general public explored the beauty beyond bioinformatics together with Linas Tamosaitis from the University of Kent at "Bioinformatics: the unity of numbers and art" in our second Science Espresso. In our third discussion, the DNA was taken beyond the limits by Prof. Dr. Rolandas Meskys from Vilnius University at the discussion "XenoDNA: New Generation tool for treating diseases". The lay public was not only introduced to classic DNA structure and functions, but participants were also acquainted on how XNA differs from DNA. Moreover, they explored how it broadens disease treatment options, as well as discovered which diseases can be treated with this technology and how it can be used in other fields. We organised a workshop on enzyme production in biotechnology during the international DIYBio Network meeting in Vilnius. We showed how enzymes are detected in nature, transformed into bacteria and purified for the best activity. DIYBio Network connects researchers, makers, artists, and scientists via their interest in DIYBio and the desire to shape their own future by the process of creating. Collaborating with the latter our team created a project for the DIYBio Network of Nordic and Baltic region international meeting in Vilnius, under coded name "siNbiosis". 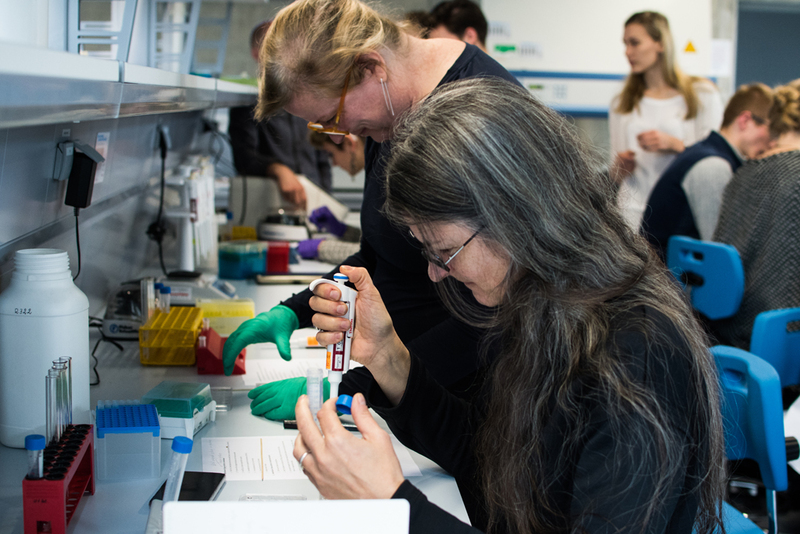 One of the project events was a workshop, where members of the network as well as other interested people explored the main steps in enzyme production. Around 20 people gathered to try to identify enzymatic activity in nature, to test new functions of transformed Escherichia coli bacteria and finally to check the purified enzyme activity. 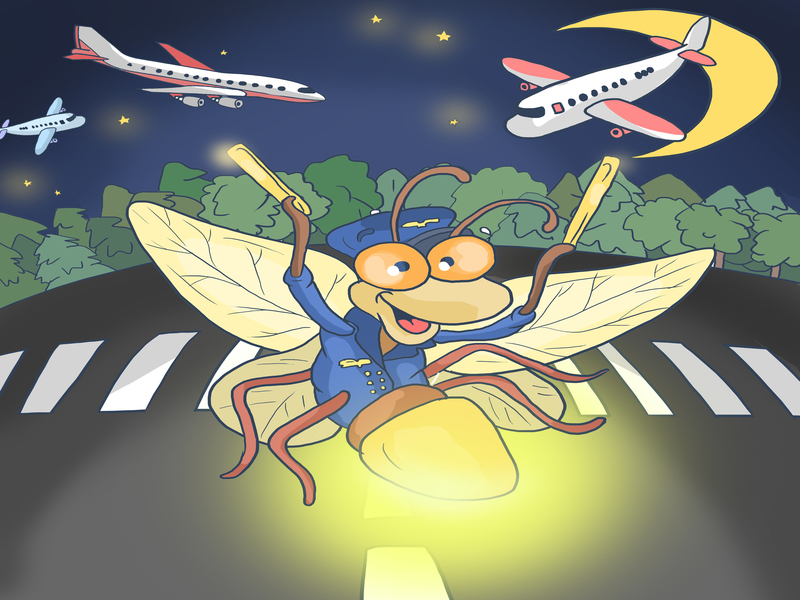 We also tried to answer questions on how the scientists "domesticated" microorganisms, what new tricks they taught them and which biotechnological advances await us in the future. As part of our science communication activities, we presented ourselves in the mass media by giving interviews and attending radio shows. By representing our team in the media we were able to spread the message about us, the iGEM competition and synthetic biology and to reach a bigger audience.